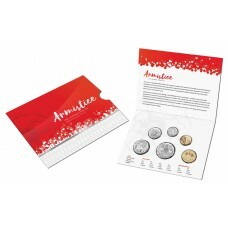 Comprises an example of all six circulating Australian coinage denominations. All Brilliant Uncirculated coins are housed in eye-catching, informative RAM packaging. Tremendous value-for-money at just $25! A highly-anticipated release, the Royal Australian Mint's sensational 2018 Mint Set is here! Launched to coincide with the 100th anniversary of the signing of the Armistice in 1918, the latest in this much-admired collector series will enjoy even more widespread appeal than usual. Along with collectors, Australian history buffs and militaria aficionados will join the fray rushing to secure this affordable, legal tender keepsake.